Your Full Service Alpaca Farm!! 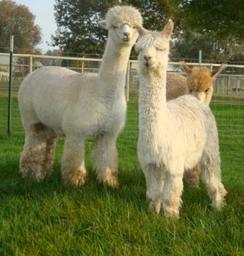 Quality Huacaya & Suri Breeding Stock; Fiber Alpacas; Companions & Pets! 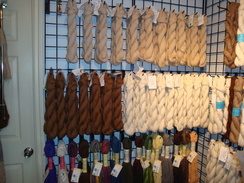 Yarns from Sandollar Alpacas Herd Available in the Leather Sandollar! One of our students winning in a Youth Showmanship Class! 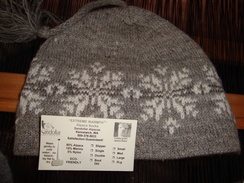 Winter Hat Made from Yarns Produced from Sandollar Alpacas herd avalable in the Leather Sandollar! Sandollar Farms & Alpacas is a full-service alpaca farm. If you need one or more alpaca related products or services, we are either able to provide it or direct you to the appropriate alternative resource. Check out some of our services and products below. 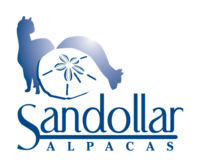 · Breeding Stock Sales - You will find a variety of premium, seed stock breeding quality and pet quality Suri alpacas at Sandollar Alpacas. All of our female alpacas are registered and sold with a reproductive warranty. Some can be purchased already bred, some can be purchased with breedings to the buyer's choice of wholly owned herdsire; and some are sold with a recent cria at side. · Mentoring After the Sale - To us, the most important aspect of the sale is the service after the sale. Don't buy your alpacas from a farm going out of business, or from someone who doesn't offer a health guarantee. You will have questions after the sale; or your animals could have health challenges that will need to be dealt with. When you purchase alpacas from Sandollar Farms & Alpacas, we will come along side you for as long as you wish, teaching and advising about their care, and answering any questions you might have. You say you didn't purchase your alpacas from us but you have questions? Give us a call; we will be happy to help! · Fiber Quality and Companion Pet Quality Alpaca Sales - We also have a wonderful selection of Sandollar Alpacas that can be purchased at a reduced cost for those customers who are more interested in the fiber arts or family pets suitable for 4-H projects. 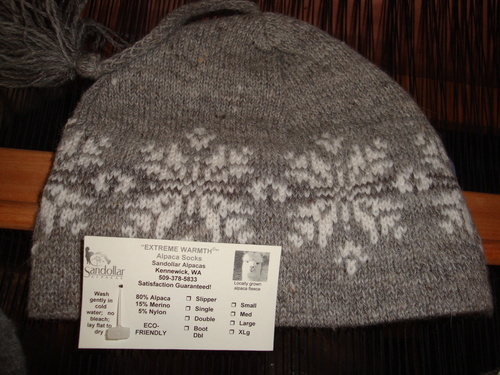 · Alpaca Education - Here at Sandollar Alpacas, we believe an informed customer is a strong customer. We offer half and full day seminars at a nominal charge. The morning session is devoted to a discussion about the alpaca history and industry; while the afternoon session is devoted to alpaca husbandry and handling. Check our website's calendar of events for our next scheduled event. · Camelidynamics Training - Nikki is an approved Senior Consultant for the Camelidynamics® program developed by worldwide known Marty McGee Bennett. If you need assistance learning how to handle your alpacas appropriately, Nikki offers lessons using Camelidynamics® approved training methods. 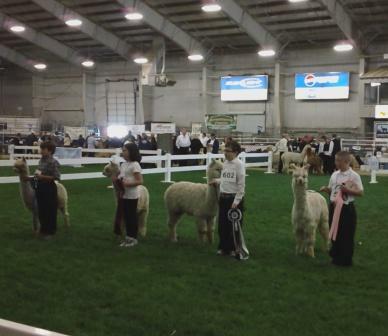 And if you need help training your alpacas for the showring, call Nikki. She will work out a fee depending on the alpaca's history and what needs to be done. · Fiber, Yarn and Product Sales at The Fuzzy Wuzzy - At Sandollar Farms & Alpacas, our raw fleece is processed each year into a variety of products. We have the yummiest roving, yarns, unique and custom designed felted projects as well as large project size felts made on our new FeltLoom; rug yarns available in a variety of colors and styles.Some of our yarn each year goes into creating specialty items for our ranch store. Come in and browse our current selection of hand-woven blankets, shawls, scarves, etc. Farm Tours - Sandollar Alpacas is pleased to schedule private ranch tours at your convenience for individuals and families at a nominal cost. Just call Collins a day ahead at 509-378-5833. The ranch is closed on Mondays. Shearing- We bring in a professional shearing team during May each year, and host shearing for our customers during that time; visitors are invited to watch this fascinating process. Call for a reservation! Miscellaneous- Need a product or service not shown here? Call us and if we can't answer your question, we will attempt to direct you to the appropriate resource. For example, we can direct you to all of the veterinarians in the area who accept camelid patients; as well as direct you to hay suppliers we have used as well as where we find the most cost effective location of supplies.